Drew: Superman changed the world. That’s obvious enough in-universe, but it’s just as true of our world. Action Comics 1 created (or at least codified) the superhero genre, a genre that came to define both the 20th and 21st centuries, and is still growing as Action Comics rings in its 1000th issue. It’s a singular achievement, but celebrating it as such might not be in the spirit of Superman, for whom humbleness is as much a part of his character as heroism. He’s not one to take compliments easily, let alone brag, so any efforts to do so on his behalf run the risk of feeling crass. Most of the stories in this issue opted to ignore lionizing Superman outright, aiming instead to illustrate what it is that makes him so laudable, but in the issue’s opening chapter, Dan Jurgens came up with a way to address the issue with Superman himself, providing a commentary on the whole exercise of a huge anniversary issue, and offering a justification that even Superman can get behind. Or, at least, he can accept it. The justification boils down to “even if you don’t like being thanked, people want to thank you every once and a while. And those thanks are far ranging. Plenty of folks are thanking him for his incredible deeds and strength of character, but we also get some more of those meta-commentaries, as Jurgens acknowledges Superman’s role in creating the genre. Supergirl suggests that Superman take a bow, but for me, the takeaway is not that Superman accept the accolades offered here, but that his fans simply want to share their love and appreciation for him. It manages to justify the issue by contextualizing it as a fan tribute, rather than a victory lap, for superherodom’s most indelible character. Michael: Action Comics 1000 is full of class act writers and artists but no one has put in more work in their story than Patrick Gleason in “Never-Ending Battle.” At 15 pages, Pete Tomasi and Patrick Gleason’s “Never-Ending Battle” is the longest story in the entire issue – and it’s all splash pages. 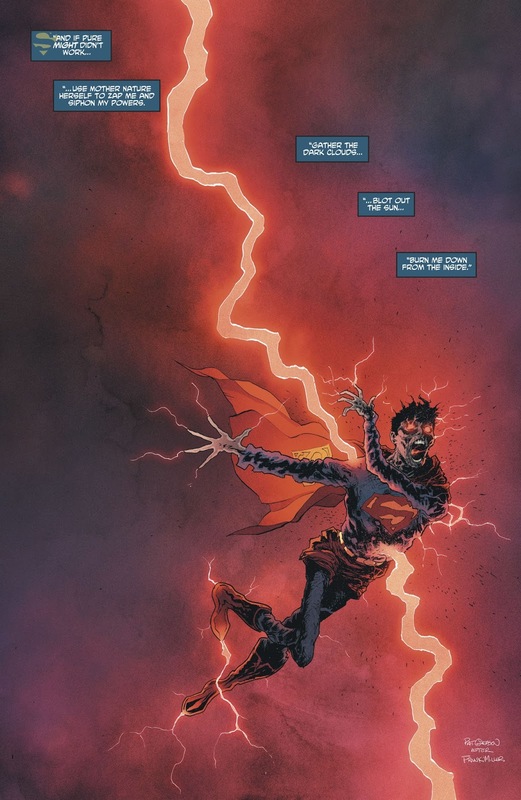 Tomasi’s script justifies this Gleason showcase by having Vandal Savage throw Superman in an endless time loop, reliving Superman’s publication history. It’s not a straightforward journey through said publication history but there are some hard-to-miss Easter eggs and references throughout. There are glimpses of Golden and Silver Age Superman, in addition to The Death and Return of Superman, Superman: The Animated Series, and iconic Elseworlds stories like Kingdom Come and The Dark Knight Returns. This is the kind of celebratory issue you’d expect from a landmark issue such as this. Early on in the time loop Superman describes how simplistic the fight against evil seemed to be, nostalgic for the days of “black and white.” The next page however, he says how it’s important to “push past the past.” This is a great sentiment for comics — and life — in general, but it kind of gets lost throughout the following pages. As entertaining of a story this is, it sometimes feels like Tomasi’s script gets in the way of Gleason’s art. There are one too many caption boxes throughout, which makes the final message muddled a bit. It would’ve been a more cohesive read if there was one specific theme, but nevertheless it’s all kinds of visually impressive. Drew: How do you tell a Superman story without Superman? The story behind “An Enemy Within” — that writer Marv Wolfman had some unpublished pages by classic Superman artist Curt Swan — sets up this interesting conundrum. We can all understand the impulse to include new Swan art in this huge anniversary issue, but the pages themselves don’t exactly lend themselves to a Superman tribute. Superman only appears in the final panel of the story, and Brainiac, the ostensible villain, doesn’t appear at all. Instead, we see Maggie Sawyer trying to talk down a hostage situation at a high school, all narrated by Superman, who tells us he’s busy fighting Brainiac drones in Japan. Shoehorning Superman into the story — including an off-screen resolution where he “overrides” Brainiac’s mind-controlling signal — makes for a decidedly lumpy narrative, only allowing us to see half of what we’re told is a much bigger conflict. It also means we can’t 100% trust our eyes. Ah, rubber bullets, retroactively justifying characters getting shot in comics since at least 1986. Despite the restrictions and the lumpiness, though, Wolfman does manage to pull a reasonably Superman-ian moral out of the pages: that Superman is as inspired by our heroism as we are of his. The result is a story that makes the most of a difficult situation. It’s far from the best work either Swan or Wolfman have ever done, but it might be just uplifting enough to justify the choice to repurpose the art here. At the very least, it’s an interesting exercise with some never-before-seen historical artifacts. True to Johns/Donner nostalgic form, “The Car” focuses in on an iconic image of comic book history: Superman smashing the car against a rock on the cover of Action Comics 1. Though only five pages in length, it’s a very effective example of Superman’s inspirational guidance. Johns and Donner take a simple ‘30s pulp villain archetype and give him humility and a modern three dimensions via Super-narration. As ever, Olivier Coipel gives weight and importance to his figures. He juxtaposes Superman on top of every other panel on that page, the omnipresent god figure. It’s a wink and nod that’s simple, earnest and a little corny. In other words – like this short story – it’s exactly what Superman should be. 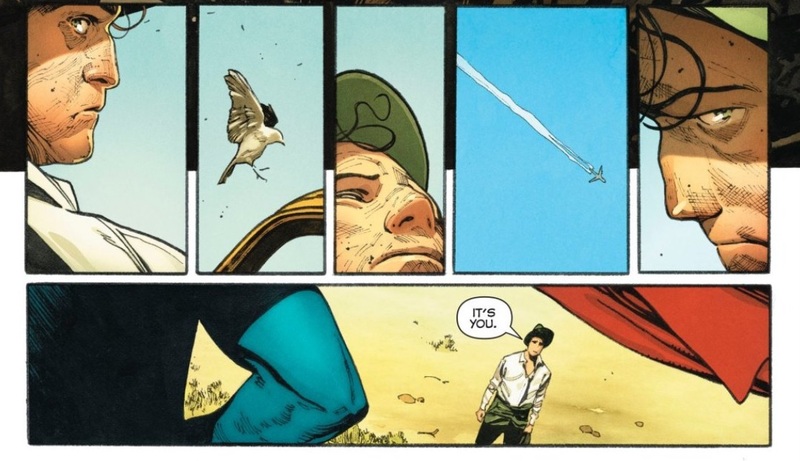 Patrick: Man, for as tight, moody and iconic as both Tom King and Clay Mann’s work is in establishing a truly unique setting for “Of Tomorrow,” I think the coolest, most effecting part of it is John Workman’s lettering. The story is that of Superman’s last visit to a long-dead planet Earth, about to be engulfed by the yellow sun that powers him. Clark address his parents and the planet simultaneously, updating them on the developments within his family. Of course, those family developments are insane — Lois is some kind of AI controlling a universal info network. For the Man of Tomorrow, the line between human being and celestial being is blurred. Workman takes that beautiful cue, and stages Supes’ speech balloons in stunning elliptical patterns on the page. It’s the perfect marriage of the path of Superman and the path of a planet. Spencer: At first glance, “Actionland” mainly appears to be an opportunity for legendary DC artist Jose Luis Garcia-Lopez to bring to life a zany, Superman-themed amusement park and to give a visual history of Superman, and honestly, those alone are reason enough to justify this story’s existence. Once writer Paul Dini reveals that the scenario is Mr. Mxyzptlk’s role-play, though, it takes on a charming bit of meta-commentary as well. Like many comic book villains, Mxy doesn’t actually want Superman to die because he simply enjoys fighting him too much. Mxy also represents the many writers who have worked on Superman’s stories over the years, though. There’s a lot of fun to be had creating “imaginary,” “what-if,” and “Elseworld” tales of Superman’s death, but no creator actually wants their final Superman story to be the final Superman story. As much as Action Comics 1000 honors Superman, “Actionland” is the only story to actually acknowledge his longevity, never-ending adventures, and the status as a pop-culture icon they give him as qualities worth celebrating. And believe me, they very much are. Superman’s been an inspiration to several generations’ worth of readers, and it’s reassuring to know that he’ll be around to do the same for generations more. Patrick: A lot of these stories are about the insane volume of good Superman does on a given day (or, in a five minute period). “Faster Than a Speeding Bullet distinguishes itself by mostly taking place between the klik and the bang of a gun aimed at a woman’s head. 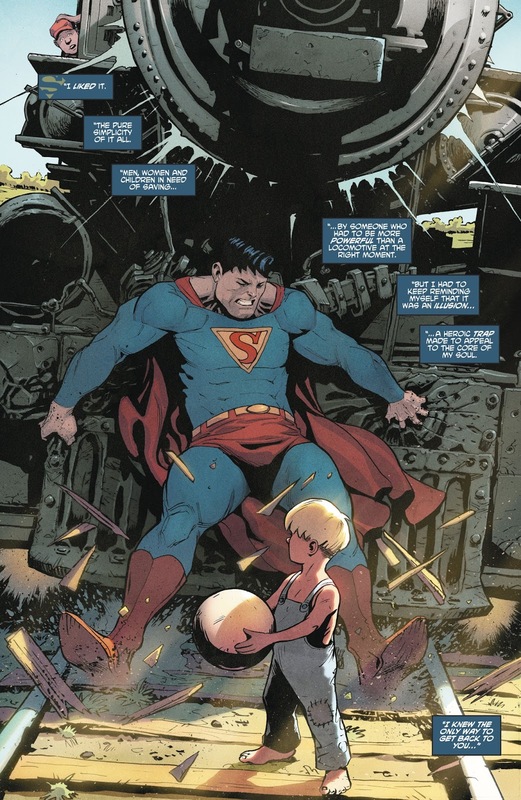 Writer Brad Meltzer and artist John Cassady gift the reader with Superman’s super senses, so we can look into the mechanism that’s firing the bullet and even catch the moments immediately after the bullet leaves the barrel. That moment is where our would-be murder victim alters her own fate ever so slightly by pushing her face into the gun. I’ve gotten so skittish around guns in fiction lately, but it’s so rewarding to see a combination of common defiance and Superman thwarting gun violence. Spencer: Unlike the other stories in Action Comics 1000, “The Truth” doesn’t have the power of nostalgia to lean on. 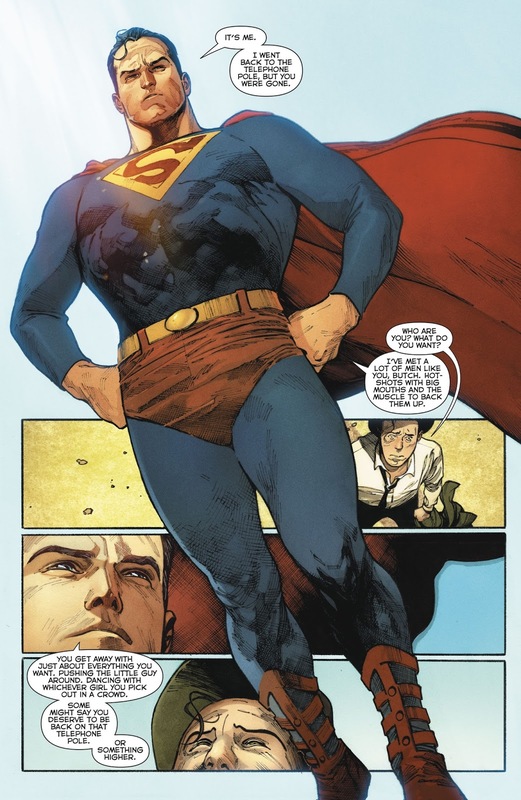 Brian Michael Bendis’ entry instead has the unenviable task of teasing the creator’s upcoming Superman and Action Comics’ runs, and while I can’t speak for anyone else, it doesn’t do a great job of drumming up my interest. The one thing I do really like about this story is the way Bendis (aided by Jim Lee on art) uses Superman’s powers — his heat vision/ice breath combo-blast and his desperate race to stop his flight before he hits a building full of civilians are clever and exciting. That said, Bendis never takes the time to show us his actual take on Superman as a character — Supes spends most of the story either unconscious or throwing around punches and generic banter. I have no idea what qualities attracted Bendis to Superman (and away from Marvel) or what kind of themes his run is going to revolve around. Instead, the story rests on a new villain named Rogol Zaar and the revelation that he is responsible for Krypton’s destruction. Zaar himself comes across as rather generic — he feels like a cross between Mongul and Doomsday — and I honestly couldn’t care less about Krypton’s history. This story teases a run more focused on lore and plot than character, and it’s disheartening. Speaking of trivia, what’s with the random obsession with Superman’s red underpants? If this is just a shout-out to the (ridiculous) internet controversy their return caused, it’s just eye-roll worthy. If there’s an actual mystery behind Superman’s trunks, I’ll scream. These two women are my biggest problem with “The Truth.” Bendis is well-known for his naturalistic banter, but their conversation feels more like a parody of Bendis than his actual work. Is this just an excuse to make a “the ‘S’ stands for hope” joke? While other stories in Action 1000 use civilian characters to draw out and highlight different qualities in Superman, these two have no real point besides (failing to) add some comic relief. Their glib banter feels strained considering the urgent, life-threatening danger they face, and their conversation even feels disjointed from the art in the above sequence, as the one woman continues to babble on about Superman even as Superman stands up. They’re an inane distraction from Bendis’ story. As someone who has only read the tiniest fraction of Superman’s adventures over the years, I think this issue’s failures might be just as interesting as its successes — there’s obviously a long, varied history from which these creators draw (or which they maybe created themselves), but all fit more or less with what we might expect of a Superman story. Not every one of those corners of Superman’s history is going to jibe with me, but I’m impressed with how well they fit with one another. Also: the size of this issue kind of prevented us from getting any meaningful cross-talk going, so we might as well do that here: the standouts for me are “The Car,” “Of Tomorrow,” “Actionland,” and “Faster Than a Speeding Bullet.” “Never-Ending Battle” comes close to the list, but I agree with Michael that it’s just a bit too wordy. Also, we skipped three stories altogether, each with decidedly big-name creative teams (Levitz/Adams, Snyder/Albuquerque, and Simonson/Ordway), but I feel like those are probably the weakest (though the Simonson/Ordway one feels the least disposable). I’m curious to hear everyone’s thoughts on the successes and failures of this issue. I meant to comment on this earlier – I don’t know what it is, but Snyder is not doing it for me these days and his Action Comics piece with Albuquerque was no exception. Just seemed kind of…cold. Well the “Actionland” story, while I don’t yet read the story itself it’s quite interesting because it brings the problem I have with the big two superheroes, that is that they never have a real ending ( unless both companies suffer a bankruptcy). The comic book community always treated the big two superheroes as modern mythology but the problem with that is mythology like the Greek, Norse and others have and ending. Of course they have different interpretations but is not like after the Ragnarok all the Norse gods don’t die. They did. There’s no retconning in those myths, just different interpretations brought by different people. There’s no real canon that passed from generations of writers, just a beginning and an ending. The big two on the other hand don’t have real endings, just continuous canon stories passed by generations of writers. Of course there’s what-if’s and elseworlds but eventually they have real canon written by different writers. I would love to be proven wrong and would like to hear a different perspective. I would argue that Ragnarok is just as much an ending of Norse mythology as Dark Knight Returns is of Batman. Ragnarok is an apocalypse story, which therefore means it hasn’t happened yet. And because Ragnarok was in the future, there was the ability to tell an infinite number of stories between now and Ragnarok. Because the story of Odin, Baldur, Thor and the Norse Gods literally were supposed to go on until the literal end of time. The only reason people stopped making new Norse myth isn’t because they told the final story, but because people stopped believing in the Norse Gods. Otherwise, they would keep telling stories until Ragnarok finally happened and the universe ended (interesting comparison, there are people who honestly believe the events of the book Heaven is for Real happened. Would that be the modern, Christian equivalent of someone coming up with the myth of the time that Thor dressed up as a woman to trick giants). Which is just like comics, where we keep telling Superman, Batman and Spiderman stories for who knows how long. And myths got retconned all the time. These days, where Norse myth is seen primarily as a historical document to be studied or inspiration for Disney movies, not a lot of retconning happens. But back during the Viking times, there were all sorts of retcons. Many of these stories were told according to Oral tradition, and so retcons would be frequent. Superhero comics don’t have endings and get retconned a lot. Which is a feature of superhero comics. This has positive and negatives, but fits in quite similarly with how mythic figures throughout history have been treated (I’ve read that Robin Hood may have originated from Wales during the Norman Conquest, which would make be the mythic equivalent of asking which war exactly Tony Stark got captured in. The early ballads also clearly state that he is a yeoman, which is quite different from the retcon that is generally accepted today, where he is a nobleman.) Sometime issues arise from the fact that superhero comics have no ending, but no different than the issues of writing for the Simpsons. Instead, superhero comics have endings, but of a different sort. Endings of runs, that take an entire sequence of events and bring it to a natural conclusion, before the next one starts. It is not THE ending, but it is AN ending. Just as you’d tell an epic about the Aesir-Vanir war in Norse Myth, which has an ending, even though after that there are many, many stories until Ragnarok. And there is advantages to the idea of having no real endings. Because that’s how life works. The moment one story in your life ends, another begins. For all their flaws, that is one thing that superhero comics can do that many others can’t. The very act of a grand finale is a poor reflection on what life is really like, and something superhero comics are designed not to have. WHich is a great example of the strengths that superhero comics having no ending can have. But sometimes the advantages can be a detriment too.Superhero comics always have inconsequential events and melodrama. I’m not saying that it is exclusive to them but it’s prevalent and it can be frustrating when the consequence don’t matter. Not only that but it also cause the comic book community always wants more of the same, with some sprinkle of newness, no new and interesting ideas that shock the community and bring discussion to the table. I think ultimately the problem with modern superheroes from the big two is that fans didn’t want something new, they just want more of the same with sprinkle of newness.